Welcome to our full-service dance shoe boutique. Based in Montgomery Al, we specialize in shoes for partner dancing - from tango shoes to ballroom shoes, from salsa shoes to swing shoes. Our ready-to-purchase Stock Items are made up in neutral tones, with leather soles - for better performance on a variety of floor surfaces. They come in half-sizes and in narrow, medium, and wide widths. 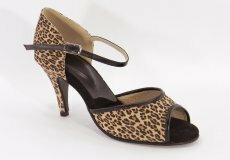 And, when you want more than just off the shelf, we provide custom-made tango shoes and ballroom shoes - offering suede soles, a variety of heels, different straps, and over 40 colors of leather, suede, and novelty fabrics. As a professional Argentine tango dancer, I require quality construction, comfort, and beauty in all Tango Salon Shoes - for customers and for myself. I wear them too! Tango Salon Shoes are hand-crafted in the USA. 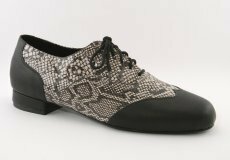 Leather-soled versions of these tango shoes and ballroom shoes are also great for street wear. Comfort, function, and elegance....you can have it all!